Wycombe Wanderers made it six home league wins on the trot with a one nil victory over high flying Barnsley at a windy Adams Park. The worst fears of Wycombe Wanderers fans have been realised with the sale of Josh Scowen, arguably the clubs best player, to Barnsley. January was always going to be a defining month for the club and the news from chairman Andrew Howard that the money received for the tigerish midfielder will “more than cover the losses” from the departure of Wasps (£229k), will certainly make next season a smoother prospect. Unless you have been in a coma since June, you will be more than aware that the club’s aim this season was League Two survival whilst steps were made to sort the finances out. Wasps have gone and the crowds are beginning to creep up at Adams Park. Not even the most optimistic fan would have predicted that the Chairboys would be top of the table in January and playing some of their best football for a good few years. It’s this situation that will no doubt make the sale of Scowen a contentious topic amongst the Chairboys’ faithful. On paper it looks a strange move for the player, with Barnsley delicately positioned in a congested League One mid table. From Wycombe’s perspective it is a bit more understandable, with Scowen being out of contract in the Summer. Having rebuffed offers to extend his contract at Wycombe, selling now avoids the need for the lottery of a tribunal and the income can be put to work behind the scenes. The player will have needed to agree this move though and will now be plying his trade at a higher level. No doubt that there will be fans who would have liked to see Scowen stay and potentially be in League One with Wycombe Wanderers next season. On the other hand, there will also be those that agree with the stance of sticking to the two year plan and paving the way to a full recovery. 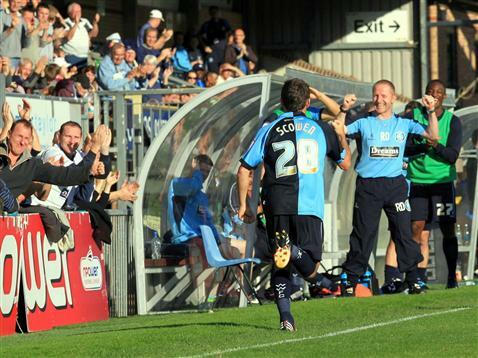 Josh Scowen on his way to celebrate his first Wycombe Wanderers goal with Richard Dobson.